So this anime starts of typically like any other romantic comedy anime. We got a guy named Makoto who is in love with a girl he met on the train. 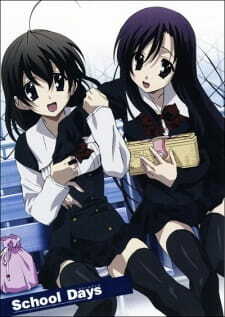 Of course, who else would find about his crush none other than Sekai Saionji, which is his best friend at school. He doesn't know it yet but Sekai has feelings for him and so you have this nice little love triangle form. With Sekai trying to help him confess and show his feelings for Kotonoha, she becomes more and more depressed. So, this is your typical romantic anime plot. At this point you might think that the anime might not be as bad as I described in the introduction. But wait! Makoto here is portrayed as an utter idiot which have no shame and acts all perverted. Somehow, the girls around him actually put up with his twisted personality and throughout the whole series you will be putting up with his "common sense" and pretty much too high of a self-esteem. In other words, you can pretty much call him a huge jerk. He pretty much sleeps with nearly all the girls in the anime. If this doesn't already get you mad, what will? So pretty much all respect and morality gets torn away as the anime progresses. We got a whole lot of betrayal, lies and deceit from then on to the end. The last episode is basically the "answer" to everything. I won;t go into detail what happened but basically Sekai kills Makoto by stabbing him with a knife repeatedly after she discovers that he patched up with Kotonoha at the last minute. Kotonoha then discovers the body and is shocked. She then contacts Sekai to meet up on the roof on the school using Makoto's phone. They meet up and after some conversing, Kotonoha then rushes in a slices Sekai's throat leaving a bloody mess. And so that is how the story ended. Now you know why this anime will make you extremely angry and frustrated. Art? Ok, it was decent. The characters had round faces and large eyes. Something quite unrealistic but brought out the "cuteness" in them until you saw the true colours of Makoto. Then you will definitely hate his face. Characters aside, the art style and animation was rather well detailed. Other than that, everything else was rather bland. Ok, the theme songs were utterly boring. Voice acting was rather good, except when I saw Makoto's face I was instantly tuned out. I didn't want to look at his face or listen to his wimpy voice. The other girls besides Sekai and Kotonoha were more respectable for me because they didnt have that much screen time and did not directly involve themselves as the main characters did. I can't remember if there were any memorable or interest music present throughout the anime; but it was probably rather bland. The characters were terrible; especially Makoto. How many times did I want to punch him in the face? Pretty much every second of his screen time. Sekai and Kotonoha seem friendly and innocent at first but they become victims themselves in the end. The other girls were basically portrayed as Makoto's "toys" and basically had no relevance to the main characters and to the story. Overall, it was not an enjoyable anime to watch if you have tendencies to rage at characters. I hated Makoto and the rest of the characters because of the lack of morality and respect that these characters portrayed. Surely enough, I have come to understand that even though this anime was terrible it gave a strong warning message about betrayal, love, and hate. Basically, don't be a jerk. I really can't recommend this anime to anyone, it is mentally scarring and can give you a negative impact of varied proportions. Story? What story? Some pretty messed up relationships here. Characters were decently illustrated and some detailed in backgrounds. I hated Makoto's face. Boring theme songs and unmemorable soundtrack. Voice acting was rather bland. Enjoyment rating went downhill after watching the first couple of episodes. It was a terrible anime to watch. Was there a point to this anime? If there was, someone tell me!